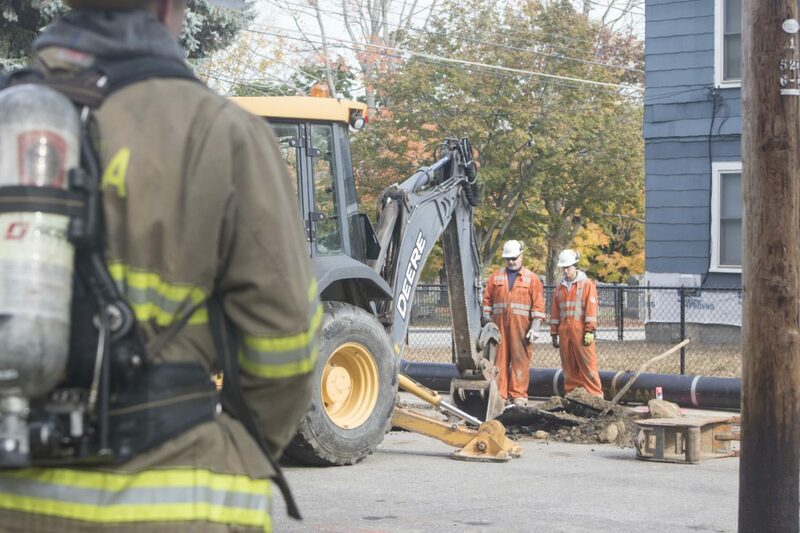 NASHUA – While construction crews continued working in the area of Woodward Avenue and Kinsley Street Tuesday, an excavator severed a 2-inch natural gas supply line while digging in the street. Liberty Utilities spokeswoman Emily Burnett said a contractor working on water lines in the area accidentally severed the natural gas service line to 150 Kinsley St. No other customers were affected and no evacuations took place during the incident. Before the situation was brought under control, she said crews were getting a reading of 100 percent gas in the area of the severed service line. Nashua Police Department Lt. Carlos Camacho said after detouring traffic for approximately 45 minutes, everything got back to normal. He said at the time, traffic was light, so things weren’t too backed up and that everyone was cooperative and understanding. Owner and President of Joseph P. Cardillo and Son Inc., Mark Cardillo, said sets of crews from his construction company were replacing the water mains all throughout the city for Pennichuck Water. He said the dig-safe law requires them to hand dig on 18 inches of either side of the marked area, but there was an issue with the painted marking. “They sent me all the pictures and the report and I reviewed it all, and it’s clearly evident it was marked wrong,” Cardillo said. Nevertheless, officials said there were no injuries or evacuations, while damage proved minimal. Liberty Utilities shut the gas off and repaired the line by early Tuesday afternoon.